August 3-14, 2020 Sold out! Airfare to Germany not included. Booking deadline is May 31, 2019. Single and triple accommodations are not available on the August tour. A passport valid for six months past the ending date of this adventure is required. 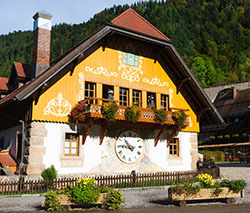 The world-famous Oberammergau Passion Play only comes around once a decade, and Bluegreen owners and their guests will be there in 2020! This Owner Adventure has proven so popular that we’ve sold out two dates already and have added this August departure so more owners can take advantage of this once-in-a-lifetime opportunity. Begun as a promise by villagers to reenact the last week of Jesus Christ’s life if spared the ravages of the Black Death plague, the Oberammergau Passion Play has been a theatrical tradition in this Bavarian town for almost 400 years. 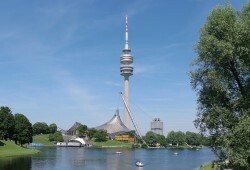 The Passion Play is just one stop on our guided tour of Germany’s most famous cities, medieval towns and scenic areas. See Cologne’s famous gothic cathedral with its twin-steepled towers, Berlin’s historic Brandenburg Gate and Munich’s 1972 Olympics sites. Enjoy a day cruise on the most scenic section of the Rhine River, where fairy-tale castles, terraced vineyards and idyllic villages line the banks. 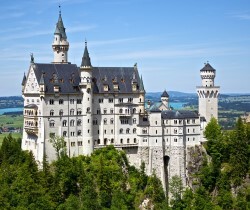 Visit King Ludwig II’s Neuschwanstein Castle, which inspired Walt Disney’s design of Sleeping Beauty Castle in Disneyland. Walk about Rothenburg, a walled town that has retained its medieval character. Watch a woodcarver in action in the Black Forest and sample delicious Black Forest Cake. Ride a funicular railway up to Heidelberg Castle to see the Great Vat, a 58,000-gallon wine cask built in 1751 that is so large it has a dance floor on top. 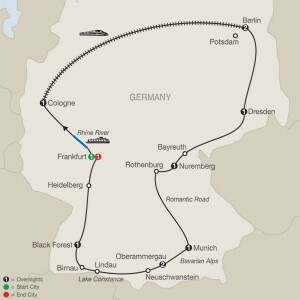 This adventure features extra excursions to some important World War II historic sites, like the Dachau concentration camp and the building where the Allied leaders met for the post-war Potsdam Conference. 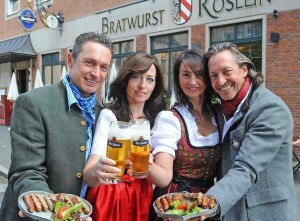 Get a true taste of Germany—including its fine beer and bratwurst—and be a part of Oberammergau’s momentous event. Prices and accommodations based on availability, per person double occupancy and subject to change without notice. Globus tour inclusions are accommodations; some meals; gratuities for wait staff for included meals; on-tour first-class ICE train transportation, Cologne to Berlin; on-tour motorcoach transportation; funicular railway ride in Heidelberg; guided sightseeing; admission to Oberammergau Passion Play; admission to attractions; and hotel baggage handling. Fares shown are in U.S. dollars for new reservations only and are subject to availability. Not included: airfare; airline baggage fees; airport or departure taxes; vacation insurance; gratuities for hotel housekeepers, tour manager, local guides and driver; alcohol, food and beverages outside of the contracted Globus menu as presented at a hotel or restaurant; optional excursions; vacation insurance for non-U.S. residents; passports; items of a personal nature; and any incidental charges. Cancellation fees apply. 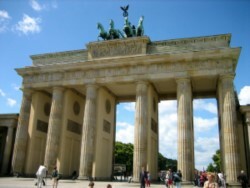 Price is per person based on double occupancy and includes the Globus tour inclusions noted above plus these additional inclusions: Potsdam excursion; Bavarian Evening excursion in Munich; Dachau excursion at Munich; Berlin dinner excursion; airport transfers in Frankfurt August 3 and 14, 2020 for August departure and June 15 and 26, 2020 for June departure; gratuities for tour manager, local guides and driver; and taxes. Reservations must be booked by May 31, 2019. Nonrefundable, non-transferrable deposit of $1,000 per person is due at time of booking. Final payment due by April 15, 2020 for August departure and March 15, 2020 for June departure. Prices, additional fees, itineraries and availability are subject to change without notice. Certain terms, conditions, and restrictions may apply. Please call us at 800.459.1597 for additional information. Fares shown are in U.S. dollars for new reservations only and are subject to availability. Not included: airfare; airline baggage fees; airport or departure taxes; vacation insurance; gratuities for hotel housekeepers; alcohol, beverages and food outside the contracted Globus menu as presented at a hotel or restaurant; optional excursions; and all other items of a personal nature. Great Vacation Destinations, Inc doing business as Bluegreen Travel Services, is located at 4960 Conference Way North Suite 100, Boca Raton, FL 33431. Great Vacation Destinations is an Iowa Seller of Travel No. 688, Washington Seller of Travel No. 602-283-711; Florida Airlines Reporting Corporation (ARC) registration No. 15-72225-4, California Seller of travel registration No. 2068362 (Registration as a Seller of Travel does not constitute approval by the State of California). Void where prohibited by law and where registration and/or licensing requirements have not been meet. In the event of a conflict between Globus’ Details of Participation and Great Vacation Destinations’ Details of Participation, Globus’ Details of Participation shall govern.